Kharma represented another Dutch affair. They really put up a giant effort and hauled a truckload of audio gear and furniture to Munich. Hauling is one thing. Setting it up and taking it down afterwards is the real sweat. Though it’s the end result that counts, this effort should be acknowledged going in. With a décor matching the dark brown Kharma color and 20 or so plush freighted-in arm chairs the room was extra damped. On the side wall decorative panels doubled as acoustic panels just as the silver-framed leather paneling at the front of the room did. Good Kharma chief Charles van Oosterum proudly pointed at his new preamp which is based on tried ‘n’ true practices like silver-wound power transformers—they simply sound better than copper he quipped—and all components are hardwired by hand. It felt like déjà vu all over again. Circuit boards had been superceded. Many visitors stayed here for prolonged periods. This exhibit had very comfortable seats, a nice atmosphere and great music. What more does it take? The next K in our list was Kazuo Kiuchi. 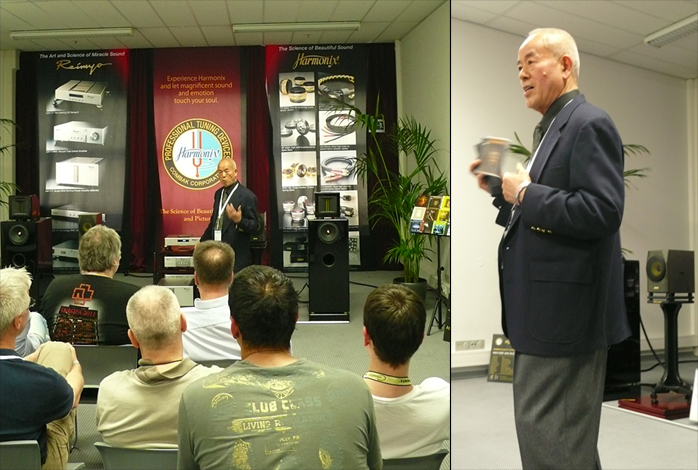 With his brands Harmonix and Reimyo, Mr. Kiuchi roams the world and is present at most all audio shows. Besides developing Harmonix accessories and Reimyo electronics however, Kazuo is also busy remastering. He is the man behind an increasing amount of XRCD2 releases of various classics. In Milan last year he presented a remastered Harry Belafonte At Carnegy Hall, music we grew up with. This year he proudly introduced volume IV of Best Audiophile Voices. For those interested in jazzy female and male voices, check this out. With careful remastering and additional XRCD2 treatment of original recordings there’s proof aplenty that 16/44.1 is alive and kicking. Decorations in this room were focused on the best listening experience. Large banner backdrops covered the entire front wall. 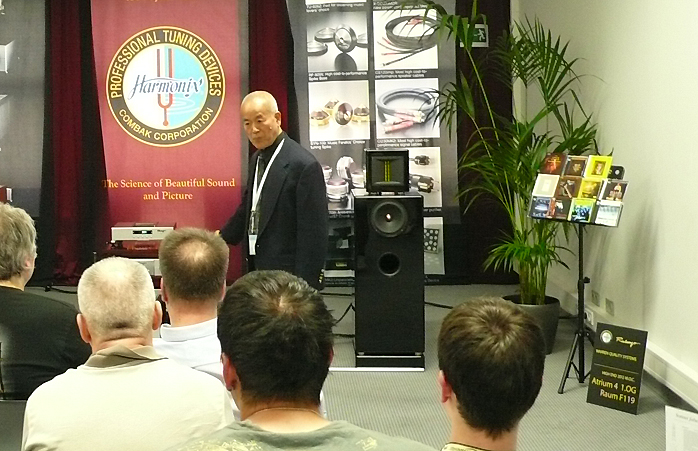 Kiuchi demonstrated his electronics not only with his own Bravo speakers but also much larger speakers like Sonus Faber and Ascendo from the portfolio of his German dealer Virgil Warren. As one of the acknowledged masters of room and equipment tuning it was fun to watch and learn how he set up loudspeakers and tuned them to perfection to the room. 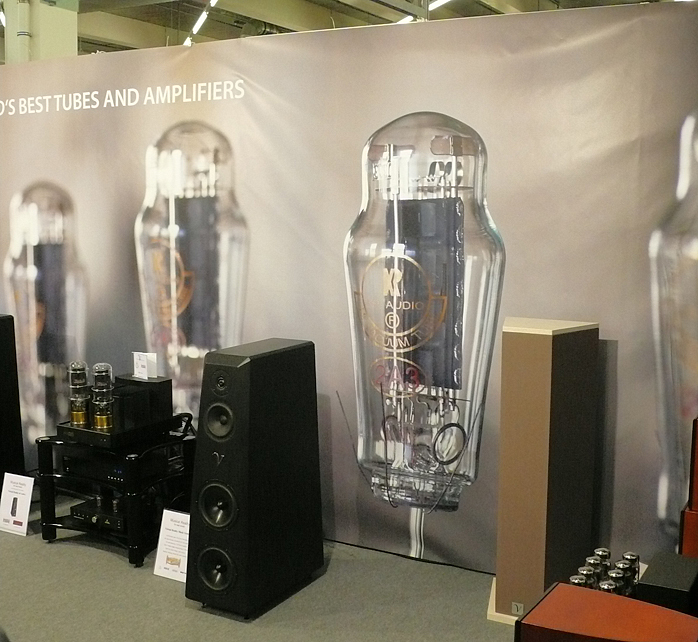 KR and Von Schweikert is a classic combination for Dutch distributor Musical Reality. 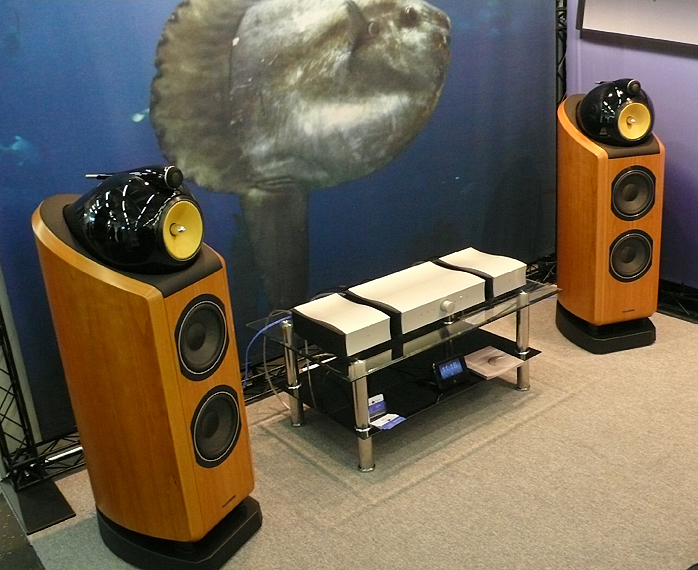 With a stand in the ‘zoo’ section of High End it’s never easy to play music and have just that be the prime attraction. Hence a well thought-out presentation is important to draw people to your stand. Here it was a nice backdrop with playful photos of KR tubes. Add Cor Dekker’s enthusiasm and stamina and this worked. The recipe was simple - good old-fashioned craftsmanship from a man who knows his stuff. Mola Mola is a new brand. It's Dutch and the formalization of the joint venture between Hypex director Jan-Peter van Amerongen and the aforementioned class-D wizard Bruno Putzeys. Together they took on the challenge of now marketing a turn-key product rather than OEM modules as they’d done for uCD. Being clever they opted for a booth in the Zoo combined with an all-out press release assault. That must have worked gangbusters as each time we passed by the booth was busy with visitors. Under the hood of the curved mono amps sits the already renowned Ncore module but contrary to the evaluation models we reviewed recently, the Mola Mola version gets an enhanced discrete input stage to further improve the circuitry. Besides the power amps there’s also a multi-purpose preamplifier whose functionality can be scaled up with additional plug-in boards (DAC, phono). Much detail and know-how gathered from Bruno’s pro audio ventures—see Grimm Audio for instance—has pooled into these Mola Mola products where a preference for balanced connections betrays those roots but also caters to consumer convenience with unbalanced socketry. Everyone we talked to or overheard seemed pleased with the final cosmetics. Those are Bruno’s other brain half in action. He is responsible for the industrial design as well as all graphics - a true multi talent. 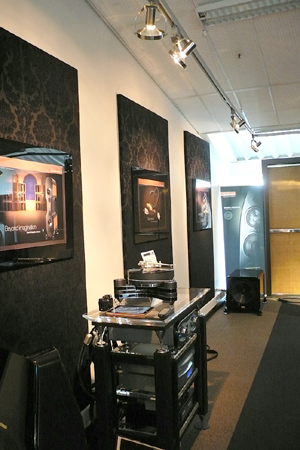 With a simple display of two component sets in an open corner booth decorated with a custom backdrop, a comfy couch and a pair of B&W speakers, there was enough enthusiastic but knowledgeable personnel on hand to keep visitors informed and entertained. The whole was ‘whole’. And as mentioned earlier, these Dutchies’ first encounter with a large consumer show overwhelmed them a bit due to the unexpected size of it all. In Europe Antwerpian Frank Vermeylen distributes MSB Technology. 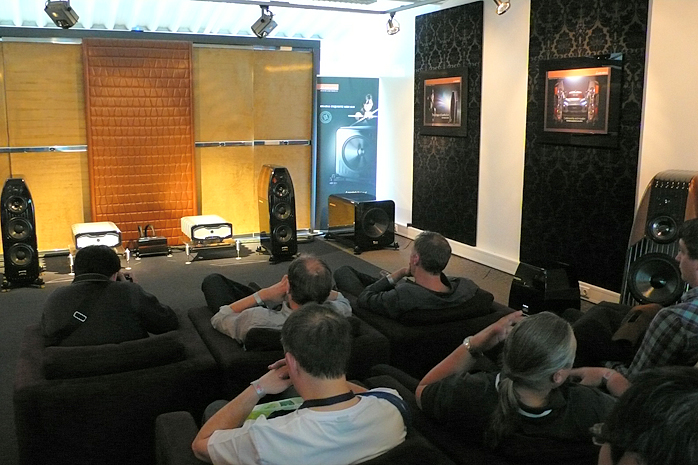 He teamed up with SW Speakers and Solid Tech equipment racks whose respective owners Sinan Wasif and Björn Ohlson were on hand. The eye catchers of course were the multi-module Magic Flute loudspeaker of Sinan’s design. With his mastery of working in carbon fiber not only in audio but also aerospace and F1 environments, he has crafted a good-sounding loudspeaker. MSB drew our attention to their new Platinum DAC IV while Solid Tech followed the new color preferences of white and black-anodized aluminum. About the display, a huge backdrop with a photo of an Antwerp quay complete with (in)famous cobblestones rounded things off. Siltech and Crystal Cable never miss a show. 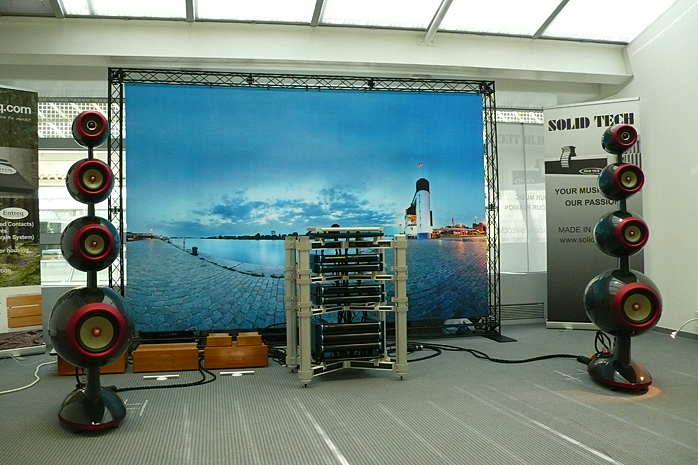 The focus this year was a new Siltech amplifier. For this occasion the earlier Arabesque backdrop of a gold and red-clad concert hall had been replaced by a clean and clear one highlighting the new Crystal Cable Absolute Dream series and Siltech’s Structural Amplifier Gain Architecture or SAGA. Of course both Gabi and Edwin van der Kley were present. Their backdrop doubled as division to create a listening area and another office/pantry/meeting space. Gabi explained that the cost for such a custom banner is a few hundred euros. There’s thus no excuse why not every exhibitor could make their space attractive if they just paid attention..
Sonically things here were very eye-opening. 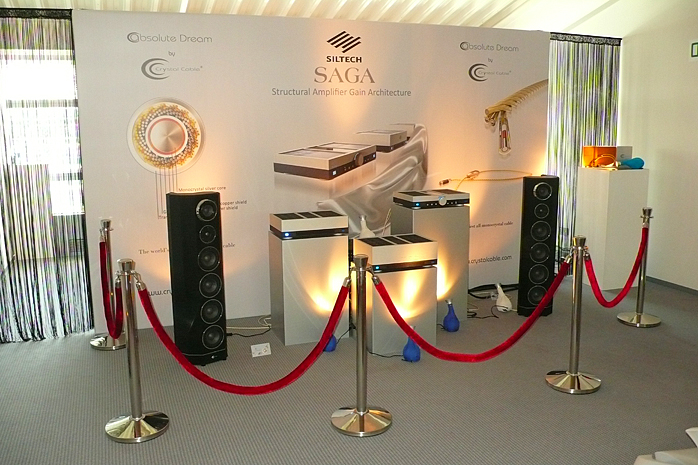 With Edwin’s SAGA he has created a three-chassis amplification concept. It all starts with the battery-powered tube-based C1 control unit. This does not attenuate the incoming signal. Siltech believes that first attenuating the signal only to later amplify it again reduces dynamics and increases noise. The output of his control amplifier feeds into the battery-powered V1 amplifier which uses tubes for variable voltage gain (factor of 24). The P1 current amplifier meanwhile is wall-powered but applies no further gain. Siltech claims 14-hour battery playing time for the C1 and V1 prior to needing a recharge but there’s also a play-while-you-charge mode.